At the north end of Mary Ann Bay there is an outcropping of sedimentary rocks in conjunction with the dolerite which predominates along this section of coast. In the photo, the dolerite forms the headland behind, and contrasts quite starkly with the outcrop in front. Looking at the rock, I suspect it is metamorphosed. My Hobart geological map doesn't help. There are Permian deposits in various places; I suspect this is rock which has been overlaid by the dolerite, and is probably from the Malbina Formation which is present elsewhere on South Arm. This rock is fairly gritty, and somewhat bedded, but not like the usual undisturbed sandstones around Hobart. At the south end of the bay the Mary Ann Bay Sandstone has overlain the weathered surface of the older dolerite. 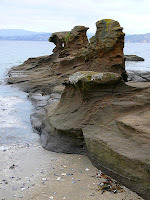 However, I'm unclear how this outcropped sandstone at the north end relates to the dolerite and Mary Ann Bay Sandstone. I'm pretty sure the northern outcrop is NOT Mary Ann Bay Sandstone; the description is wrong and I'm sure they'd have mentioned this easy-access outcrop on the beach in writing about the incidence of it at the south end. Next time I must find this Mary Ann Bay Sandstone, which has attracted quite a lot of interest over the years.